OVCR: "UPM Student Researcher Grant for CY 2018"
"The Office of the Vice Chancellor for Research is pleased to announce that the Research Grants Administration Office (RGAO) is now accepting applications for the UPM Student Researcher Grant for CY 2018. 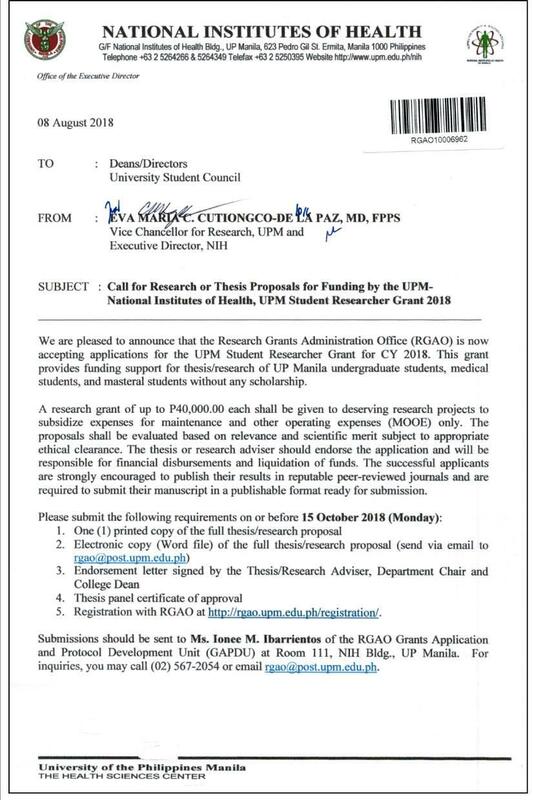 This grant provides funding support for thesis/research of UP Manila undergraduate students, medical students, and masteral students without any scholarship..."
Attachment: Copy of the disseminated memorandum. Submissions should be sent to the Grants Application and Protocol Development Unit (GAPDU), RGAO at Room 111, NIH Bldg., UP Manila. For inquiries, you may call (02) 567-2054 or email rgao@post.upm.edu.ph.